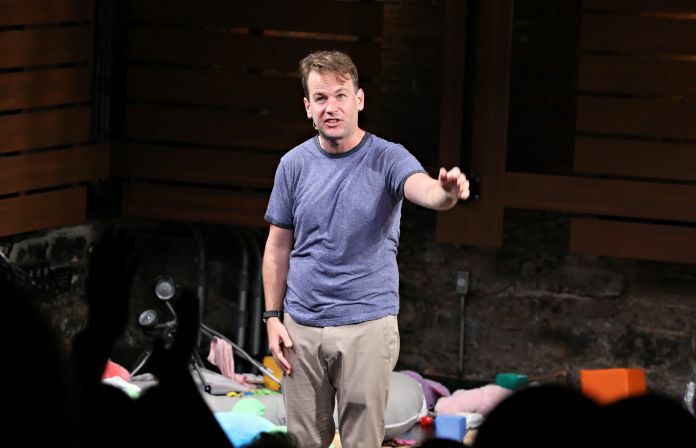 Mike Birbiglia’s one-man show “The New One” will transfer to Broadway’s Cort Theatre this fall. The show, which will be produced by Kevin McCollum, begins preview on Oct. 25, 2018, with an opening night on Nov. 11. It will play a limited engagement through Jan. 20, 2019. “My goal is to make as many people laugh as possible and ideally several hundred will cry. My producer Kevin McCollum and the Shubert Organization are letting me do that in a space that will accommodate the right amount of people. Which is about 1,100,” Birbiglia said in the press release. After a nationwide tour, “The New One” premiered off-Broadway at the Cherry Lane Theatre this summer, where it played a limited run after opening on Aug. 2, 2018. This will be the Broadway debut for Birbiglia, who has previously performed his other one-man shows, “My Girlfriend’s Boyfriend” and “Sleepwalk With Me” off-Broadway. The show is written by Birbiglia, with additional writing by Jennifer Hope Stein, the wife of Birbiglia. It is directed by Seth Barrish and will feature Broadway set design by Beowulf Borritt, lighting design by Aaron Copp and sound design by Leon Rothenberg. Ira Glass, host and creator of “This American Life,” which features Birbiglia as a regular contributor, is an executive producer.